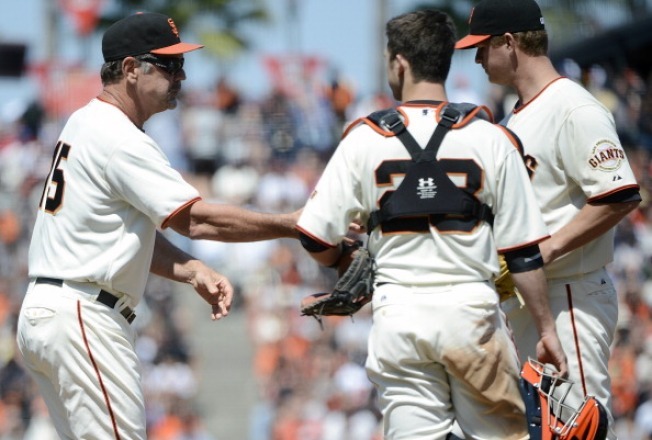 It was the usual locker room banter for the San Francisco Giants Wednesday. Everyone had Melk on the mind. Melky Cabrera's MVP-like year is over at least for the regular season. The San Francisco outfielder was suspended 50 games Wednesday following a positive test for testosterone, putting an abrupt end to what had been a remarkable regular season and throwing the Giants' playoff hopes into doubt. "Ultimately, it was just a bad decision,'' catcher Buster Posey said. Cabrera leads the National League with 159 hits, and is second in batting average behind Pittsburgh's Andrew McCutchen. Cabrera's penalty was the first for a high-profile player since last year's NL MVP, Ryan Braun, had his suspension overturned by an arbitrator last winter. The suspension would extend into the playoffs if the Giants advance. Cabrera is batting .346 with 11 home runs and 60 RBIs in his first season with San Francisco and is five hits shy of 1,000 in his big league career. Flashing bright orange spikes, he singled and hit a two-run homer last month in the National League's 8-0 win in the All-Star game, earning MVP honors for the game and securing homefield advantage for the World Series. Cabrera is set to become a free agent after this season, so he might have cost himself a big pay day, too. Cabrera could still win the NL batting title. He has 501 plate appearances, one less than the minimum required to win a batting championship for a player on a team playing 162 games. However, under 10.22(a) of the Official Baseball Rules, he would win the batting title if an extra hitless at-bat is added to his average and it remains higher than that of any other qualifying player. He will miss the final 45 games of the regular season and serve the remainder of the suspension at the start of next season or during the postseason, depending on whether the Giants make the playoffs and how far they advance. If the Giants wanted him to become active in the middle of a playoff series, they would have to play a man short from the start of the series until the suspension ends because rosters can't be altered mid-series. Cabrera became the second Giants player to receive a drug suspension this season. Reliever Guillermo Mota was penalized for 100 games in May, becoming just the third major league player disciplined twice for positive drug tests. Mota is eligible to return Aug. 28, barring rainouts, and began a minor league rehabilitation assignment Tuesday with the Giants' rookie team in Arizona. It was not immediately known whether Cabrera's positive test occurred before the All-Star game. The union initially filed a grievance, which would have caused the case to go before an arbitrator, but then dropped it, a person familiar with the process said. The person spoke on condition of anonymity because that detail was not announced. Cabrera told CSN Bay Area on July 27 that he had been tested for performance-enhancing drugs the previous week, though it's unknown whether the test he referenced resulted in the positive test. Manager Bruce Bochy broke the news to his team in a meeting about 90 minutes before the start of a 6-4 loss to the Washington Nationals. Drug-testing labs check urine for its ratio of testosterone to epitestosterone, which usually is 1 to 1 in adult males. If the lab notices any abnormality, it conducts an isotope ratio mass spectrometry (IRMS) test to determine whether the testosterone is exogenous, or came from outside the body. There have been four suspensions under the major league drug program this year, with Philadelphia infielder Freddy Galvis and free agent outfielder Marlon Byrd also suspended 50 games apiece. There have been 70 suspensions under the minor league drug program. In mid-May, MLB and the players' union agreed to drop the 100-game suspension imposed on Colorado catcher Eliezer Alfonzo for a positive drug test because of the same procedural issues that came up in the case of Braun. Alfonzo missed 48 games _ the final 15 of last season and the first 33 of this year. Braun's 50-game suspension for a positive test was overturned in February by arbitrator Shyam Das after Braun's lawyers argued his urine sample was not handled in the manner specified by baseball's drug agreement. Das, who had been baseball's permanent arbitrator since 1999, was fired this spring. The Braun case led to revisions in the drug agreement between owners and the players' association to better define procedures for handling the urine samples. Last December, slugger Manny Ramirez received a 50-game suspension for a second positive drug test. The 12-time All-Star signed a one-year minor league contract with the Oakland Athletics on Feb. 20, but was released in June per his request while playing for Triple-A Sacramento before even reaching the big leagues with the A's. Ramirez retired from the Tampa Bay Rays in April 2011 rather than serve a 100-game suspension for a second failed drug test. The penalty was cut to 50 games because he sat out nearly all of last season. The 28-year-old Cabrera, who became a marketing phenomenon this year with nicknames like ``Got Melk?'' ``Melk Man'' and ``Melky Way,'' produced a 51-hit month in May. Cabrera batted .429 in May with three homers, five triples, seven doubles and 17 RBIs. He hit safely in 25 of 29 games. The 51 hits matched Randy Winn for most hits in a month since the club came to San Francisco in 1958. Cabrera also set the San Francisco record for most hits in May, passing Hall of Famer Willie Mays' 49 from 1958. A-Rod tutored both Cabrera and Robinson Cano when they were coming up, even inviting Cabrera to Miami to work out with him in recent years. Cabrera came to the Giants in a trade with Kansas City last November that sent left-hander Jonathan Sanchez to the Royals. Cabrera _ who signed a $6 million, one-year deal to avoid salary arbitration _ batted .305 with 44 doubles, 18 homers and 87 RBIs last season. He is a big reason San Francisco began play Wednesday tied with the Los Angeles Dodgers atop the NL West. Cabrera had been listed in the original lineup Wednesday, batting third and playing left field. Gregor Blanco replaced Cabrera. Bochy said he wrote that lineup before notice of the suspension. San Francisco said it will not make a roster move until Thursday's off day before opening a weekend series at San Diego. The clubhouse was closed before the game when the news of Cabrera's suspension broke. San Francisco optioned reliever Dan Otero to Triple-A Fresno after Wednesday's game and is expected to call up two hitters Friday in San Diego. Bochy and general manager Brian Sabean also plan to discuss who might be available outside the organization.